Other Products by Gaspari Nutrition. Search other Amino Acids products. 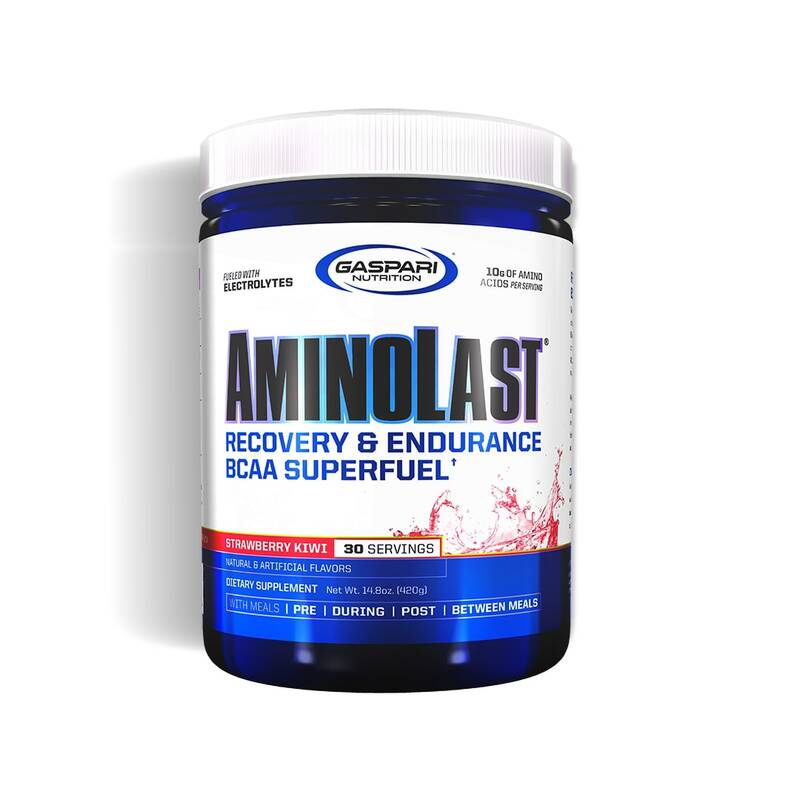 Aminolast - Recovery and Endurance BCAA SuperFuel! 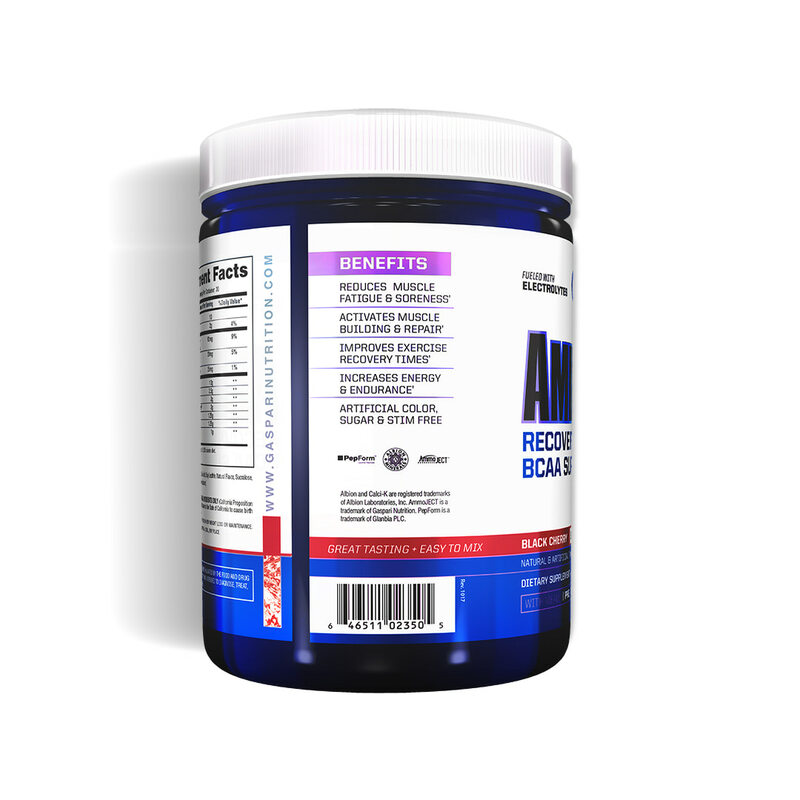 Gaspari Nutrition Aminolast with Ammoject technology delivers a massive 10g of amino acids per serve, including BCAA's, powerful Leucine-enriched peptide amino acids, anti-cramping electrolytes and Ammoject (L-Ornithine L-Aspartate), to rid your muscles of waste products such as ammonia that build up during exercise causing muscle fatigue and hindering performance. Power packed with 10g of amino acids, 1 gram of aminoject and loaded with electrolytes you only need 1 serving per training session and will feel the resutls from the very first dose. Aminolast will help you reach your goals whether it be putting on muscle or increasing endurance. 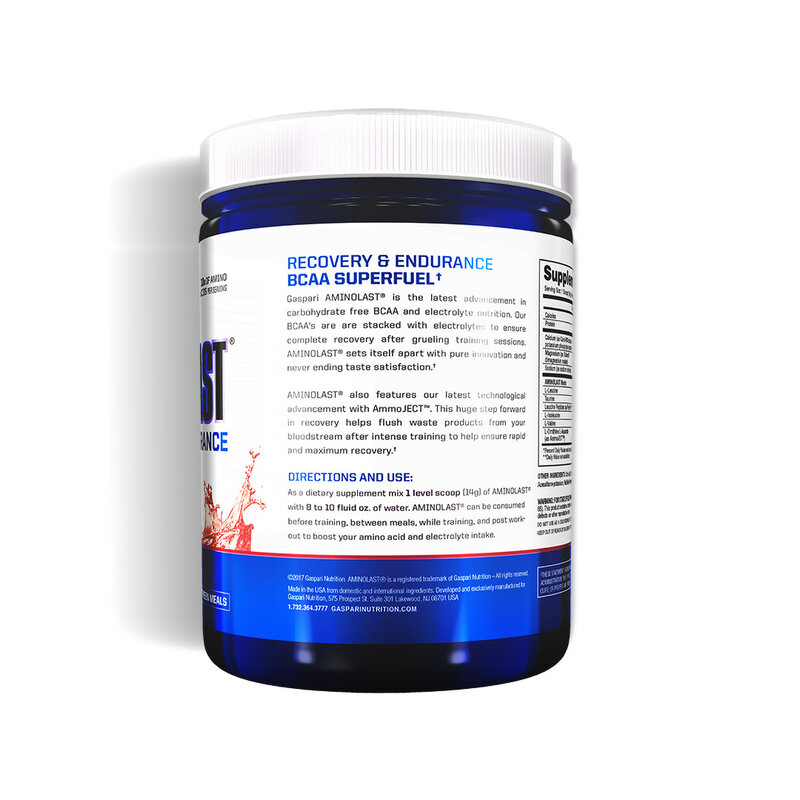 Aminolast speeds recovery time and reduces soreness so you can train hard every time. 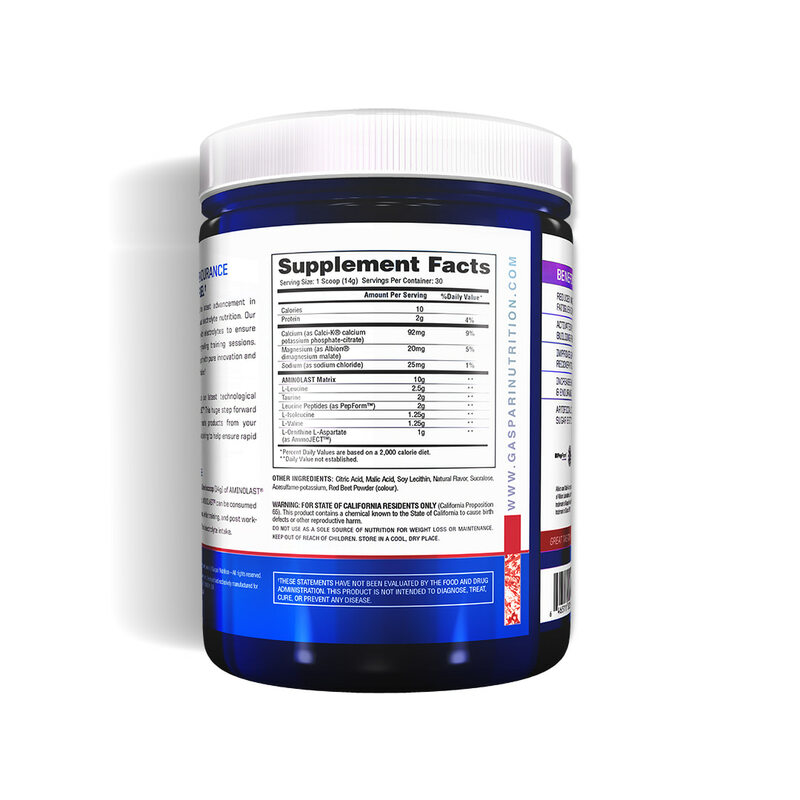 As a dietary supplement mix 1 level scoop (14g) of Aminolast with 8-10 oz of water. Aminolast can be consumed before training, between meals, while training and post-workout to boost your amino acid intake. 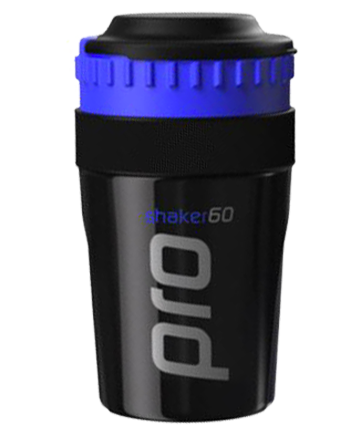 Speed recovery time; Reduce muscle soreness; Increase hydration; Reduce muscle waste producets and delay muscle fatigue; Support lean muscle gains. Bodybuilders; Weight trainers; Crossfit; Swimmers; Runners; Martial arts; Team Sports Competitors (e.g. Netball Players, AFL Players, Rugby Players); Any athlete or sports person wishing to speed recovery time and reduce soreness, and improve athletic performance helping you perform at your peak during every session. OTHER INGREDIENTS: Citric Acid, Malic Acid, Natural Flavours, Sucralose, Acesulfame Potassium, Turmeric Powder (Colour). ALLERGEN DECLARATION: Contains milk ingredient.